The Dyna-Glow 6 burner gas grill has a simple construction and weighs only 91 pounds. It is a lightweight and inexpensive gas grill that would benefit from a smaller size, removing the side burner, and being made with better components. 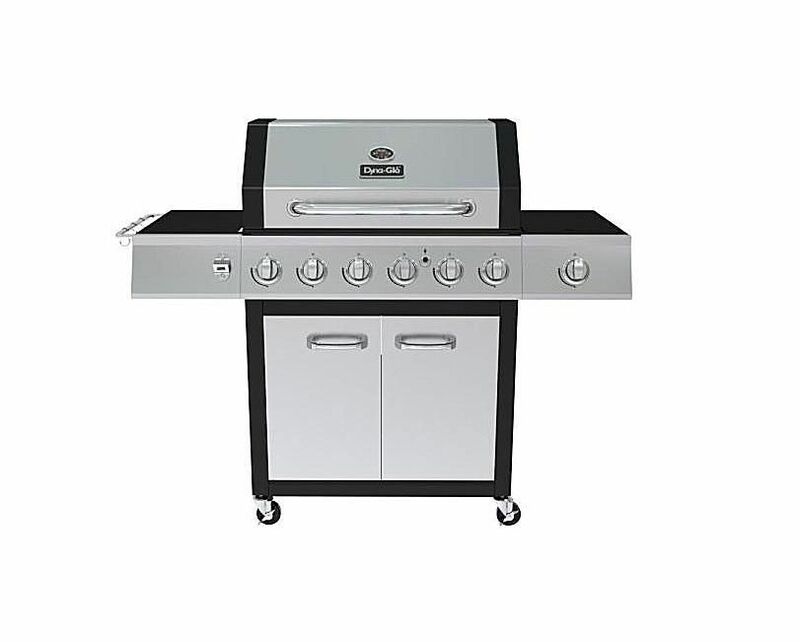 This gas grill is over five feet wide, providing a big grill at a low price point and relatively lightweight compared to comparably sized grills. The six burner grill seems excessive and while large, the grill is not made to withstand high volume use. Based on its size and low cost, these features may be a selling point for a person looking only at superficial details and not grill capabilities. While the size of the grill may impress others, it's wiser to spend more for a much smaller, higher quality, and better-built gas grill. When considering purchasing a grill, it can be helpful to list out the pros and cons of the grill and review all of its features. The Dyna-Glow brand of grills is only sold at Home Depot, which may impact your decision making. Since Home Depot has a showroom of grills, it can be helpful to visit your local store and see this grill (and others) in person prior to making a final purchase. As always, when considering a gas grill in this price range, it's wise to consider a charcoal grill, which can easily be found at a similar price point. You can get a great charcoal grill for less money and it will last for much longer. However, with a charcoal grill, you will lose the convenience that comes with a gas grill and will need to be prepared for the extra time and effort required with a charcoal grill. If you are set on a gas grill at a low price point, it may be better to research some other options and be mindful of offseason grill sales at local retailers. That way you can find the type of grill you are looking for at a price point that suits your budget.